James Thomson was born on 8 March 1823 in Cromarty, Scotland. In 1848 he became assistant Surgeon to the 7th Dragoons and in 1858 transferred to the Reserve battalion of the 44th East Essex Regiment of Foot. In 1850 he accompanied his Regiment to Malta where there was a serious epidemic of cholera which cost the lives of many men including all of the Army Surgeons with the exception of Thomson who was later commended for his work. Later in that year the main 44th Regiment arrived in Malta and the reserve including Dr Thomson was amalgamated into one Regiment. Following a spell at Gibraltar in 1854 the 44th Regiment embarked to Turkey for the Battles of Crimea. Dr Thomson was present at the Battle of the Alma and was made responsible by Lord Raglan for the care of the wounded Russians which was made even more difficult given his lack of Russian and their lack of English, low medical provisions and little food and water. His actions were witnessed by a war correspondent from the Times Newspaper who filed the below report. We have lately been told again and again, that the increased civilization and humanity of modern times will greatly mitigate the horrors of war. To a certain extent this is undoubtedly true. Our list of Russian prisoners proves it. Russians easily got rid of such encumbrances by the summary method of the bayonet. I felt proud of my country when I saw little groups of English soldiers tenderly nursing wounded and dying Russians on the field of Alma the day after the battle, particularly when my indignation was hardly calmed at the well -proved stories of ferocious feeling manifested by these same wounded. In several instances they treacherously fired at or stabbed the doctor who had just dressed their wounds, or the kind Samaritan who had slaked their parched throats with a draught of water; thus showing all the inextinguishable hatred of a dying wild beast, and none of the noble chivalry of a civilized soldier. Notwithstanding the ingratitude of these poor Russian slaves, an English Doctor, to his eternal honour, volunteered to remain behind, and endeavour to alleviate the sufferings of seven hundred wounded Russians who had been removed from the field of battle, on the south bank of the Alma, to the deserted village on its north bank. Dr. James Thomson, Assistant-Surgeon of the 44th Regiment, and his soldier-servant, deserve to be held up as heroes. For four or five days they, and they alone, had to wait upon and support this enormous mass of severely- wounded men. The task was in many respects a most dangerous one. As we have seen, the patients themselves were not to be trusted. The Cossacks might also at any time make prisoners of them on the retreat of the allied armies. The dead were festering in heaps around the sick and dying. These two men frequently had to bury a horrible mass of carcasses and fragments before they could get at some poor wounded wretches. In this way they must with their own hands have dragged out and buried some two hundred. There was no food of any kind for the sick, so the soldier managed to drive in a stray bullock, and with the aid of some Russian convalescents (their misfortunes seem to have humanized them) he killed it and made some soup for them.At length Her Majesty’s ships Albion, Vesuvius, and the steam transport Avon, arrived. The whole crew of the first landed, and removed the wounded on board the Avon, while the Vesuvius guarded the shore. the midst of this humane occupation, a Russian force of some four thousand or five thousand men approached the village, and the sailors were obliged to hasten on board, as it was beyond the range of the ships’ guns. How- ever, three hundred and forty wounded were put on board the Avon under the charge of them heroic preservers, Dr. Thomson and his servant. About forty were left behind ; and many of these poor fellows, who had previously seemed unable to walk, endeavoured, with all their might, to hobble after their more fortunate comrades. The next day, the Avon proceeded with them to Odessa. Now, surely, when the Humane Society rewards a man who saves one single individual, society will not fail to do something for two men who, under such dreadful trials, saved the lives of three hundred and forty. Sadly a few days later, on 5 October 1854, he succumbed to cholera. The report had made him a household name and his death added to his fame. No national awards followed but his friend Sir James McGrigor led a campaign for a memorial. 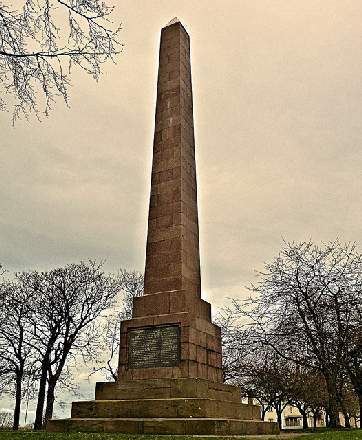 Such was the feeling that the memorial fund was oversubscribed allowing the construction of a 65 ft granite obelisk and the establishment of a memorial fund to be used for bursaries of children in the Cromarty area of Scotland. "He was present with the 44th Foot at the Battle of the Alma in 1854, and a few days afterwards, when the British were leaving the field, he volunteered to remain behind with seven hundred desperately wounded Russians. Isolated from his countrymen and endangered by the vicinity of large bodies of Cossacks, ill supplied with food, and exposed to the risk of pestilence, he succeeded in restoring to health about four hundred of the enemy, and embarking them for Odessa. He then died, from the effects of excessive hardship and privation. This public monument is erected as a tribute of respect for the virtue of an officer whose life was useful and whose death was glorious"